President Trump’s Tax Reform: What are the Goals? 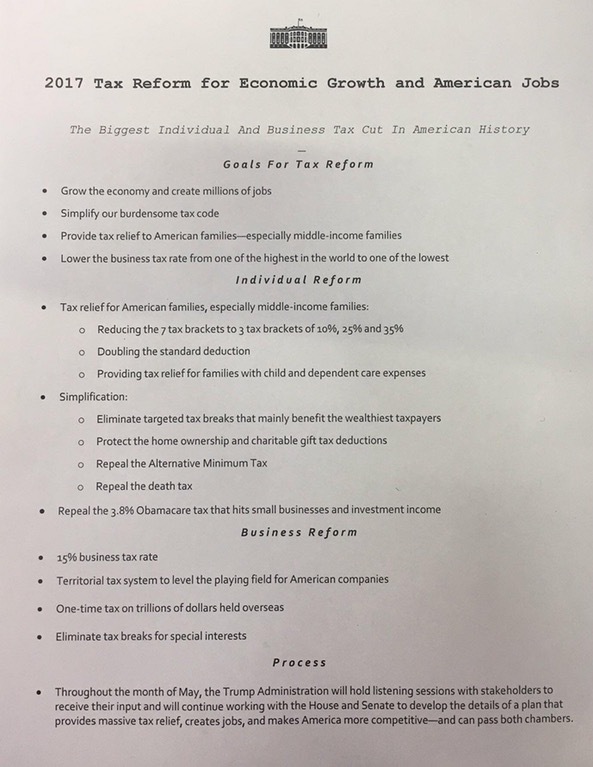 The White House recently released a one page document outlining President Donald Trump’s goals and key features for tax reform. The document titled “2017 Tax Reform for Economic Growth and American Jobs,” includes proposals for both Individual and Business tax reform. Its significance goes far beyond just a few words on a page and includes substantial tax cuts, such as reduced corporate tax rates, flattened individual marginal income tax brackets, and repeal of the estate and alternative minimum taxes. The subtitle of the document is “The Biggest Individual and Business Tax Cut in American History.” However, according to Treasury Secretary Steven Mnuchin and Trump economic adviser Gary Cohn, details of the President’s proposals will need to be further discussed and negotiated with congressional leaders. As tax legislation develops over the coming months, we will monitor the progress and do our best to keep you informed. As mentioned earlier, it is important to remember that there is a tremendous amount of detail to be worked out before any of the proposed tax reforms become reality. In the meantime, if you have questions about how these tax proposals may impact you, please do not hesitate to contact us.